I know I'm a bit late on the bandwagon, but I have finally tried out COLAB dry shampoo and it is pretty awesome! I have seen bloggers rave about it for ages but just kept forgetting to pick one up. It is definitely worth buying and it is a beauty bloggers must have! 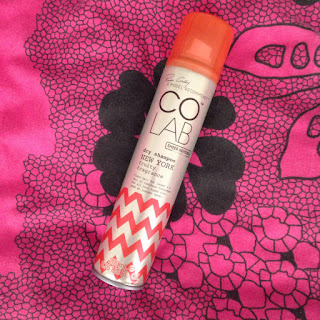 COLAB has been developed by a dynamic collective of beauty experts who combine the best of their backstage knowledge. The dry shampoos come in 5 different fragrances (New York, Paris, London, Rio and Tokyo). I went for New York which is a fruity fragrance made up of apple & melon with a light amber finish. I was going to get Tokyo or Rio but they only had them in 100ml and I wanted a 200ml. The New York fragrance is really good, I am so glad I got it because it is really refreshing and a nice reminder of Summer. My hair looks fresh again and less greasy after using it, this is the perfect solution if you forget or don't have time to wash your hair. It also helps add a little volume to your hair and a bonus is that there is no residue afterwards. It costs £3.49 for 200ml and £1.75 for 100ml, COLAB is very reasonably priced and I hope they venture into different hair care products.